The concentrations in the home vary depending on the age of the home and the quantity of pressed wood products. Here is a partial listing of products that may contain formaldehyde or formaldehyde releasing agents. Use “exterior-grade” pressed wood products (lower-emitting because they contain phenol resins, not urea resins). 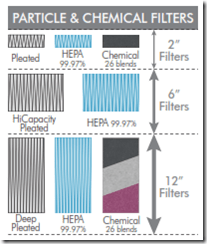 HEPA + Activated Carbon Chemical Filter. 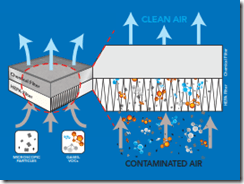 RECIRCULATION – the air filtration system continuously recirculate the air in the environment and progressively reduces the concentration of contaminants. 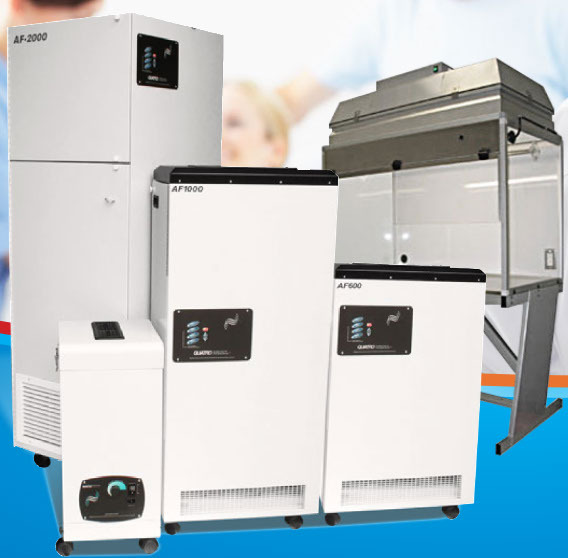 Our BreathEasy PRO series of industrial, commercial grade air filtration systems, air purifiers configured with plenty of chemical odor filtration media will help make a difference in the indoor air quality in your lab, laboratory, clinic, or workplace. It will help reduce your exposure to unhealthy chemical gases, fumes, odors, VOCs (volatile organic compounds). Call us for help with your product selection, toll free in North America, 1-800-626-0664, or fill out and send us the contact form on this page. Have a wonderful day at the office!! 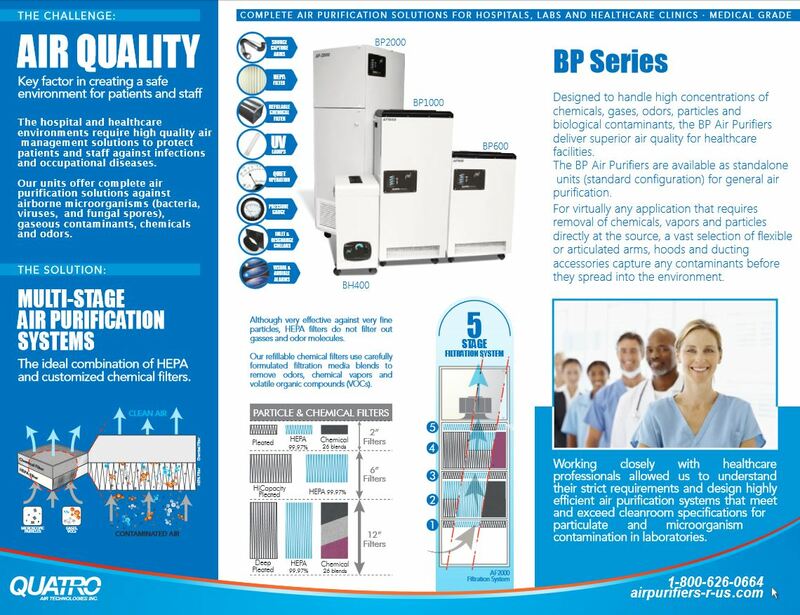 The hospital and healthcare environments require high quality air management solutions to protect patients and staff against infections and occupational diseases. 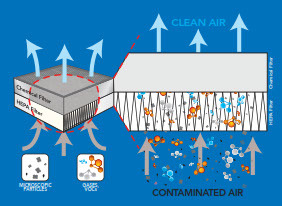 Our units offer complete air purification solutions against airborne microorganisms (bacteria, viruses, and fungal spores), gaseous contaminants, chemicals and odors. 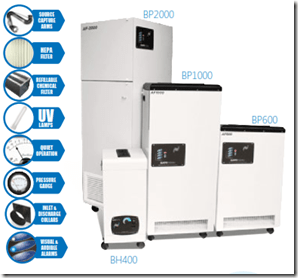 The BP Air Purifiers are available as standalone units (standard configuration) for general air purification. For virtually any application that requires removal of chemicals, vapors and particles directly at the source, a vast selection of flexible or articulated arms, hoods and ducting accessories capture any contaminants before they spread into the environment. 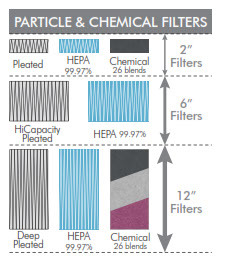 Although very effective against very fine particles, HEPA filters do not filter out gasses and odor molecules.Our refillable chemical filters use carefully formulated filtration media blends to remove odors, chemical vapors and volatile organic compounds (VOCs). message = We are looking at purchasing an air scrubber for our laboratory to help keep the chemical smells out of the office areas. We do test vinyl toluene and I noticed the RSU models remove the toluene smells. Can you recommend a model to handle 1,500 SF area. Please take a look at the BP2002 – see below – Delivery : 2 – 3 weeks or sooner.